Sunflowers are the quintessential summer flower with their bright yellow petals and golden brown centers. They are one of the easiest plants to grow and are often given to kids as their first flower to grow. 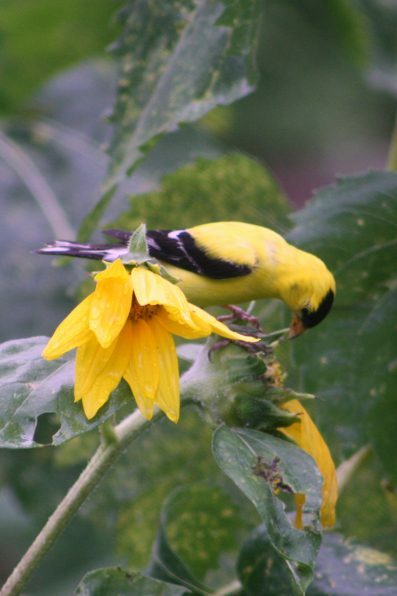 They are so easy to grow volunteer sunflower plants often spring up under bird feeders. They are native to the Americas and can be grown for beauty or for food. The flowers can grow up to 16 feet in height, although smaller varieties have been cultivated. The thick stalks of the annual plant are coarse and thick with large, rough leaves. They are tough and easy to grow and are generally heat and drought tolerant and can attract wildlife such as bees, birds, and butterflies. Sunflowers are native to the Americas. Archeological evidence suggests they were used by Native Americans as long ago as 3,000 B.C in the Southwest United States and may have been domesticated long before corn. Sunflowers were also present on the Great Plains and along the Mississippi Valley. Native Americans used sunflower seeds as food by grounding them into flour for cakes or bread. Ground seeds were mixed with vegetables or squeezed for oil. The plant was also a source for many non-food related needs such as dyes for textiles or paint, medicines, and ceremonies. The dried stalks could even be used for building purposes. When Europeans arrived seeds of the plant were shipped back to Europe around 1500 by the Spanish. The plant quickly spread across Western Europe primarily as a decorative plant. By the eighteenth century the English were using the plant for oil. Sunflowers continued to spread to Eastern Europe and by the nineteenth century Russian farmers were producing sunflower oil commercially. This was mostly due to the ban of oil during lent by the Russian Orthodox Church. Sunflower oil, however, was not prohibited. By this time two different types of sunflowers had been identified, those for producing oil and those to be used for direct human consumption. Breeding programs were implemented to produce higher yields. In the late nineteenth century the seeds that had been breed by the Russians were beginning to be introduced in seed catalogues in the United States, particularly the “Mammoth Russian.” Farmers in the United States began growing sunflowers as a food source for poultry and by the 1920s farmers were growing sunflowers for oil. Canada began a breeding program to increase yield in the 1930s and seeds from this program began to be introduced in the Upper Midwest. 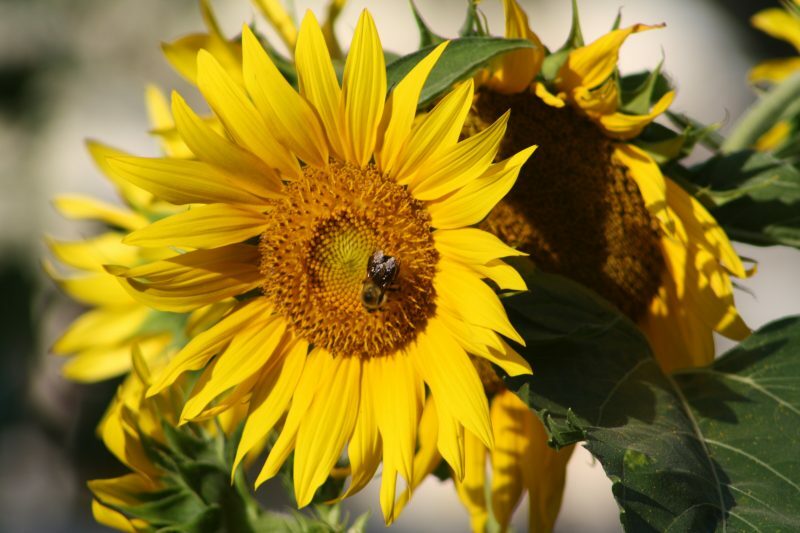 Acreage for sunflowers continued to increase in the United States and selective breeding during the 1970s produced varieties that were disease resistant and produced a better quality oil. By the 1970s acreage had increased to 5 million acres in the United States mainly due to European demand. Sunflowers love the sun and do best when the summers are long and hot. Plant in a location where they will receive at least 6-8 hours of direct sun. They are fairly tough and will grow in most soil conditions. However, they will not grow well in poorly draining soil that has standing water. After the plant has established itself it can tolerate droughts. The seeds, leaves, and stems of the sunflower plant contain a certain chemical that can inhibit the growth of other plants. This chemical is harmless to humans and animals. Don’t plant next to potatoes or pole beans. When sunflowers are used as bird seed the accumulation of seed hulls under the feeder can harm the grass. Remove the hulls often to prevent build-up. Start by loosening the dirt in the location you will plant by digging down 2 feet and about 2-3 feet wide. This will break up the dirt to allow water to drain and help the plant establish its long tap root which helps it thrive in droughts. Plant seeds 6 inches apart about 1 to 2 inches deep. If your soil is sandy plant it closer to 2 inches. Keep the seeds well-watered and they should sprout in 7-10 days. When the second set of leaves appear thin the plants to about 2 feet apart if you are harvesting the plants for seeds. If you are growing the plant for flowers they can be planted as close as 2 inches. The plant should mature in about 80 to 120 days, depending on the variety. To enjoy continuous blooms through the summer plant a new row every 2-3 weeks until about 90 days before your average first frost. Sunflower plants can be started indoors, but it is easiest to sow the seeds directly into the ground. Plant in the ground when all danger of frost has past. If you live in a location where the growing season is short, plant the seeds up to 2 weeks before the last average frost. 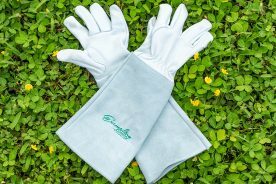 They can tolerate mild frost, but will grow better if you wait until the soil temperature is at least 55-60 degrees Fahrenheit. 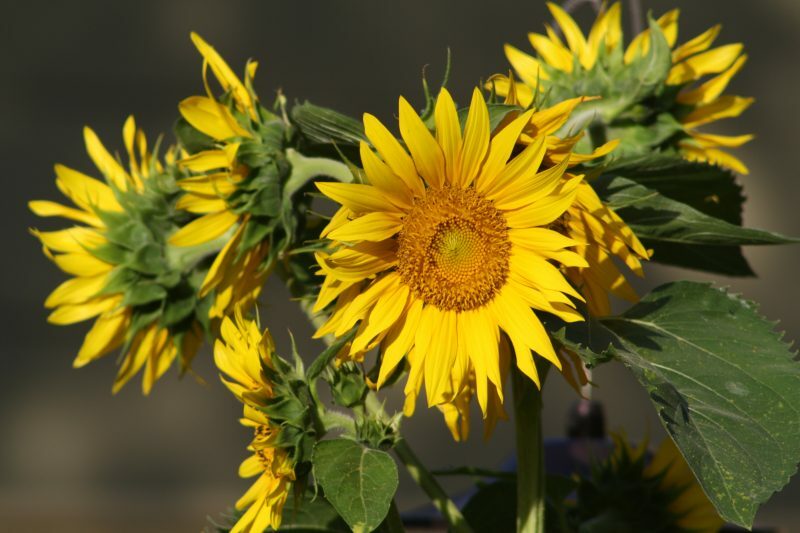 Although sunflowers develop deep roots and are drought tolerant it is a good idea to keep the plants watered 20 days before and after flowering. This encourages root growth which helps the tall top-heavy plants support themselves. Water around the plant about 3-4 inches when the plant is small so you reach the root area. Once the plant is established water it deeply, but infrequently to encourage deep roots. Several galloons once a week would be ideal. Sunflowers do not need fertilizer, but it won’t hurt. Fertilizer will create healthier plants which will produce larger flowers. Add granular, slow-acting fertilizer especially if the soil poor. Be sure not to add too much nitrogen as that will delay the flowers. Add mulch around the plants to reduce moisture loss and minimize weeds. 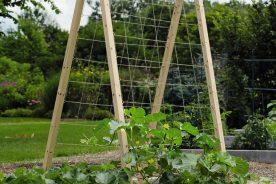 For plants that grow larger than 3 feet it is a good idea to loosely tie the plants to stakes. Large plants can be top-heavy and are weak at the point where the branches of multi-flowered plants meet the stem. Staking will help keep the plants upright in wind and rain. If you plan to harvest the flowers for seeds you will most likely have problems with birds and squirrels. The keep squirrels and birds off the flower heads after they are mature and have drooped you will need to cover each head with mesh or garden fleece. Cut away a few of the leaves that are closest to the flower head to deny birds a place to perch. If you do not plant to harvest the seeds you won’t need to do anything. Watching the birds and squirrels fest can be a wonderful pastime. Deer like to eat the tender leaves at the top of the plant and can easily destroy a sunflower patch. Fence the flowers in using 36” chicken wire. Raise the chicken wire as the plants grow. Fungal diseases, such as mildew and rust are the biggest disease problems sunflowers face. They are, however, not exceedingly common. 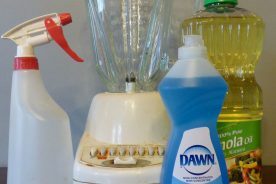 Downy Mildew occurs when the nights are cool and damp and the days are warm and humid. Fuzzy mold grows on the underside of the leaves and the top of the leaves appear spotted. Lower leaves will be infected first and it will spread to newer leaves by the wind. Mildew will not often kill a mature plant, just destroy its looks. Rust appears as yellow or white spots that turn brown or black on the surface of the leaves. Blisters may appear on the underside of the leaves and may spread to stems and flowers. Remove infected foliage and spray plant with fungicide. Infected foliage should be tossed and garden tools disinfected with bleach. The sunflower moth is another pest that may occur on sunflowers. It lays eggs in the blossoms and the larvae that emerge will eat the sunflower seeds. Remove the caterpillars by hand if there are few. If your plants are overwhelmed with caterpillars spray with a product containing Bacillus thuringiensis (Bt). Begin checking the flower heads for maturity in early fall. The flower heads should be sagging and the underside of the head will be yellow or brown. The flowers covering the seeds will have dropped off revealing tightly packed seeds. Cut the flower head about a foot below and hang in a dry, well-ventilated place to dry for several weeks. Make sure they are not exposed to insects, rodents, or humidity. When the seeds are dry remove them by brushing with your fingers. Store in an airtight jar in the refrigerator. 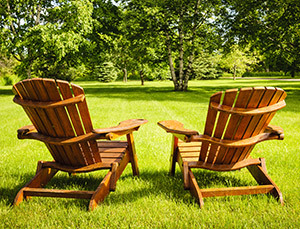 Play, work, sit, eat, get dirty, relax – whatever you do in your backyard, we are here to help you do it better. We provide all of the tips, advice, and information you need to make your backyard the haven you always dreamed of. Choosing the Right Snow Shovel: Does it Really Matter?